Library cards are free to all residents of the state of Maryland. Children below the age of 14 will be issued a Juvenile card. To receive a card the child must be accompanied by a parent/guardian with the required ID. If the teen already has a card, he or she may present the card to be upgraded to YA status when they turn 14. YA card holder privileges are limited to borrowing DVD's from the YA collection, but may borrow books from both the YA and Adult collections. Please report lost or stolen card to library staff immediately. There will be a waiting period of 60 days before a replacement card is issued, allowing time to locate your lost card. You must use I.D. to check out materials during the waiting period. When your new card is issued, you will be charged a replacement fee of $1.00. Library cards expire every three years in order to make sure that we have your current contact information. In order to renew your card, visit your nearest branch and have your Library card and proof of current address handy. There is no charge to renew your card for Maryland Residents. Non-Maryland Residents within the tri-state area (Central/Western PA, and the Eastern Panhandle of WV) will have to update their cards yearly and pay the $18 renewal fee. The library offers books, audiobooks on CD, DVD/BluRay movies, music CDs, and videogames for loan. You can borrow items at your local branch. 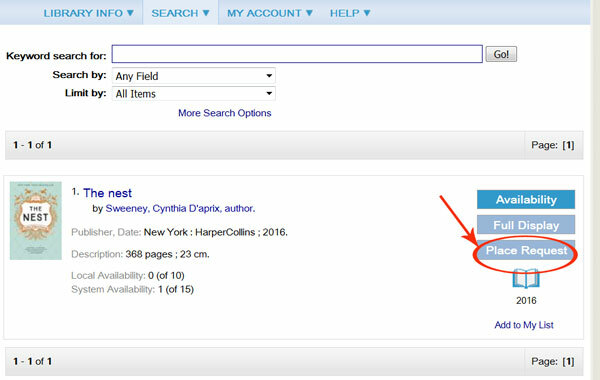 If an item is checked out or unavailable at your local branch, you can place a request for the item to be delivered. You can also borrow materials for your eReader/Tablet/SmartPhone through our e-Library. You may renew your items online or through your local branch (in-person or over the phone). Your library card number is required. You will see each item you have checked out, along with the due date and the amount of remaining renewals. Check mark each item you would like to renew, and click "Renew Selected Items." If you would like to renew all checked out items, you can just click "Renew All Items." If the material you would like is checked out, or not available at your local branch, you may place a hold. Holds can be placed by visiting or calling your local branch, or online. 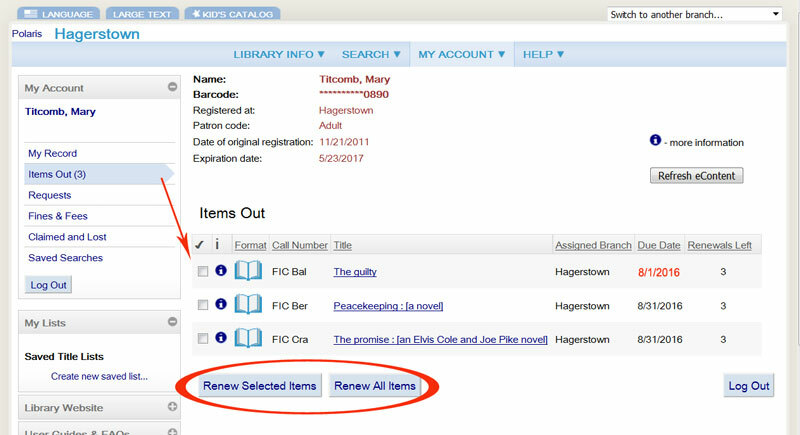 Enter your library card number and password then click "Log in"
On the next screen, select your pick-up library from the drop down menu, and your activation date, then click "Submit Request"
There is no charge to place a hold on an item. If you place a hold on an item that is listed as available, please note that holds are pulled from the shelf at 8am the following business day. You will receive notification that your hold is available for pick-up via email, text message or phone call. Please contact your local branch to change your notification options. Lost, damaged or items that are never returned will be charged to your customer account for the full replacement cost. If your fines are over $6.00, library privileges will be suspended until the balance is below $6.00. You may pay your fines online through our catalog. Click on Patron Account and log in using your library card and password. Once in your account, click Fines and Fees. Library materials may be returned to any Washington County branch. There are after hours book drops located at all branches except Sharpsburg. There is an audio/visual bookdrop at our Hagerstown location only. Please do not put any audio and video materials in the book drops at other locations.